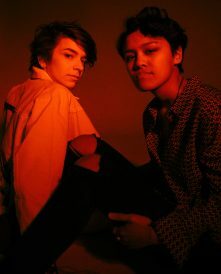 ConBoy, the indie-rock band spearheaded by two queer women has just released their first self-titled EP, ConBoy on June 22. ConBoy is the debut of Skin’s guitarist, Daisy Spencer’s passion project with artistic partner and fiance, Cherie Bugtong. This is singer and songwriter, Cherie’s premiere album and Daisy’s first solo project outside of the Brooklyn pop band, The Skins. The catchy and even more clever name, ConBoy, is derived from both women being mistaken for boys. ConBoy exudes all the messages of it’s namesake while holding those old school feelings of sentiment but with a new age twist. It sounds like the loud rock and roll of Cage the Elephant or Weezer, with the melodical intricacy of fellow artist and LGBTQ trailblazer, LP’s later work. The band’s diverse, multi-dimensional sound is reminiscent of British electro pop duo, The Ting Tings, Tegan and Sara, and the overlooked indie-rock gem, Land of Talk. Posted July 25th, 2018 & filed under Entertainment.